Fine china manufacturers A - F (alphabetical listings). This is page 1 of 3 of Peter Holland's 'Who's Who' of famous china makers in Western manufacturing. The guide gives the reader the essential facts and also tells of the prime movers, the people who started it all and how they got going. This section of the guide does not include every small maker that ever existed - just the mid-sized to large makers. We investigate the stories of the lesser known makers in our 'china chat' section. Now part of the Wedgwood group, William Adams founded the company in 1769 in Staffordshire, England. 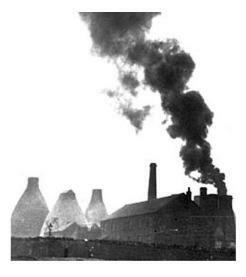 The family, now famous for Adams Ironstone, were potters from the earliest day of the history of the Stoke potteries, going back to the 17th Century. As china manufacturers they were said to rival Josiah Wedgwood for ceramic development and quality - known especially for Adams Ironstone but also made earthenwares, Parian, creamware, and Jasper wares. 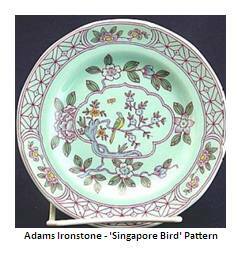 Well known pattern: - Singapore Bird. Founded 1859 in Beleek, N. Ireland by John Caldwell Bloomfield. Bloomfield was the local landowner who owned the village of Belleek. The history of this firm of china manufacturers is unique. Bloomfield was curious about the unusual luster of the finish that his tenants applied to the walls of their cottages. Rich in local clay, minerals and feldspar deposits, the peasants were just using the age old knowledge to weather-proof their homes against the Irish weather. This folk knowledge of ceramics was Belleek pottery in the raw - perhaps unique amongst china manufacturers. 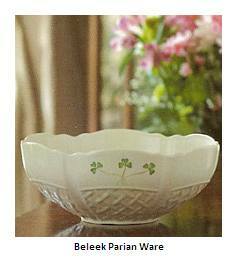 He organized the community to begin to make Belleek pottery with the help of several key outsiders. Throughout its history, Belleek's survival was always a battle between the practical, inexpensive earthenware and the delicate, expensive china Belleek Parian ware. The fine Beleek Parian baskets with delicate woven bases and flowing floral decorations are the Belleek classics for collectors. Their ware is said to be resistant to dust and cracks due to a secret glaze. Founded in Berlin by Wilhelm Caspar Wegely in 1751 Germany. In 1763 the factory was bought by Frederick the Great and became K.P.M. (Royal Porcelain Manufactory). The history of Berlin KPM declined in the mid-19th century but revived again and is still in production today. Berlin K.P.M. suffered a great deal during WW II - the most tragic history of all china manufacturers histories. Their current production concentrates on gift ware rather than figurines with a switch towards large vases and bowls. See also Dresden china manufacturers history (see under 'D'). If you look back to the true history, the porcelain is named after the place (a bit like 'Derby' or 'Worcester'). The first Capodimonte was produced in Naples, Italy from 1759 to 1780 at the ‘Royal Naples Factory’. The new factory was set in a Royal Wood named Capodimonte (translates literally as "the head of the mount" or "the top of the hill") from which the porcelain got its name. These original pieces are very rare and hard to find for collectors, mostly because they are housed in Museums. As you might guess, there is a connection between Capodimonte and Meissen. King Charles of Naples married the granddaughter of Augustus II who, of course, founded Meissen. The Neapolitan King inherited the throne of Spain becoming Charles III King of Spain (1759-1788). So he moved lock, stock, and porcelain factory to Spain. His son created a new china manufacturers allied to the old Royal Factory in Naples which was lasted until it was dispersed during various French invasions in the early 1800’s. So what is genuine Capodimonte? After the disruption of the Napoleonic wars the tradition was taken forward by a number of opportunistic businessmen - and from that point it all got a bit confusing. After the end of the 18th century, Capodimonte wares cannot be attributed to the Royal Naples factory. The N mark was originally Royal Naples, of course, but Ginori (Doccia) was the first maker to copy the N mark as ‘homage’ (first used by Ginori in 1835). Apparently, they managed to buy or otherwise obtain some original moulds and for a while at least, some sources say they attempted to emulate the Royal production of old. Today, the prolific number of Capodimonte style pieces marked with an N coronet/crown mark are not the produce of one company in the 19th or 20th centuries, but a series of different studios all carrying on the tradition begun by Charles of Bourbon, the ruler of Naples, when he began that porcelain manufactory at the place known locally as Capo di Monte (‘The Top of the Hill’). In the 1920’ and 30’s around Naples, apparently there was a flourishing of handmade porcelain flower factories. In the area of Milan, a wider array of decorative ware was developing – including the caricature figurines. In the 1950’s the companies opted to promote artists names alongside the produce. Whether or not the artist was a real person or, if they were real, whether or not they actually sculpted the pieces is a moot point. I personally know of at least one post-war Italian maker using the N backstamp who had English artists modelling the figures and then attributing the work to the ‘branded’ marketed Italian artist’s name. Some of the branded names from the post-war to late 20th century era were Borsato, Cappe, Fabris, Armani, Maggione, Cazzola, Pezzato, Scapinello, De Martino, Merli and many others. All of these branded artist may well have sculpted every last detail of the pieces which bear their name. Others may have had ‘assistants’ helping the output. 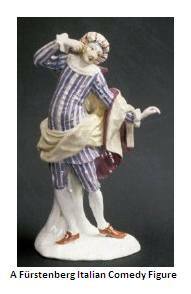 Following Naples and Milan, then came output from Florence, with a firm selling resin figurines (with a look and feel very much like traditional porcelain) under the Capodimonte N mark label. This company traded as Florence Sculture d'Arte Studio and was popular during the 1980’s and 90’s. 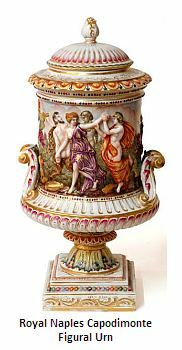 Also the town of Veneto, in between Vicenza and Bassano got in on the act and became known as a source for modern Capodimonte style wares. So always stylish and inventive, the Italians managed to create a whole modern export industry based around the memory of a very old china manufacturer. Who can object to such industry? The only thing to note for collectors is, please don't get drawn into the argument “is this a fake capodimonte”? Bear in mind there is not such thing as a fake, and there is no brand protection to speak of, the better question is “where was this item made, Italy or elsewhere?” The rest is about looking at the quality of what is in front of you and whether you like it or not. There is a following for this modern N marked Capodimonte style wares, but there is no longer one single recognizable factory, but a group independent factories all using the mark and claiming to be the original. This situation must create a headache for collectors because using the name ‘Capodimonte’ on a backstamp is easy – verifying its authenticity is not. Not everything marked Capodimonte is created equally. So just use your eyes and look for quality, not markings. Right here is a tale of how difficult business is in general and how hard the Pottery business is in particular. If it was easy everyone would do it! Be sure to take your hat off to successful china companies still around today when you witness how not to do it, in the story of Cauldon Potteries. Royal Cauldon has its roots way back with the Ridgway family and the ‘Cauldon’ works founded by Job Ridgway in 1802 (see Ridgway – antique bone china section). There were various different buy outs and partner firms too numerous to go into here. Significantly, son John Ridgway was appointed potter to Her Majesty Queen Victoria and achieved numerous awards and commendations for quality. The important thing for me is I own a set of nice but ordinary earthenware dinner plates marked with Royal Cauldon est. 1652 – “Englands Oldest Pottery”. Being in the trade I was curious – so did some digging. It turns out that the Bristol firm Pountney & Co. Ltd took over the name in 1962. Not satisfied with the Ridgway connections, they decided to plain lie. They had excavated and found pottery shards underneath their Bristol premises (unrelated to the Pountney Company) dating from c.1652 and decided to try to pull the wool over their customers’ eyes. It didn’t work. The ‘creative’ back-stamp date only served to counteract the genuine historical associations of the Ridgway name and Pountney ceased trading in 1977, having served only to discredit a once great name. 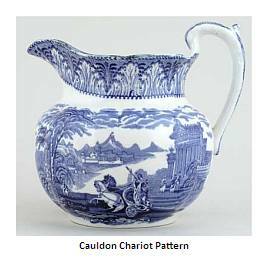 Amongst the Cauldon works most famous patterns is 'chariot'. see Modern Bone China section. see Churchill Dinnerware on separate page. see antique bone china section (under 'S' for Spode). see antique bone china section. see the Dansk Tableware page. Delphine is a pottery mark of antique bone china manufacturer, Hudson & Middleton see listed in the Antique bone china manufacturers section under "H". Founded in Denby, Derbyshire, England 1809. The main factor in the birth of the company was the discovery of clay during the construction of a new road nearby. 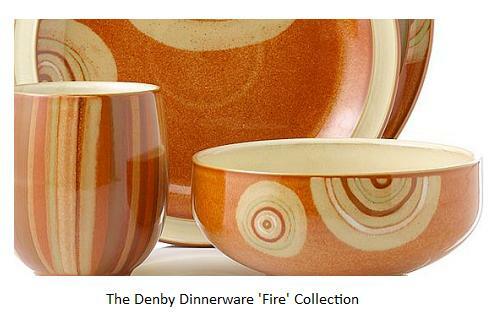 Denby's first products were salt-glaze stoneware bottles. They still makes a wide range of tableware and cook ware. Many of the original hand methods (painting, glazing and turning) are still used. When the term "Dresden" was used in the U.K. before the l940’s, it historically referred to the Meissen factory products. Meissen was the first ever European manufacturer of Chinese type hard-past porcelain in in history - 1710 to be precise (see Meissen listed under 'M'). 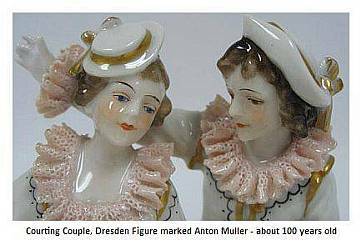 “Dresden China” nowadays is more of a general term understood to be a reference to Germanic porcelain of that region or style. Historically, the second ever European ‘Dresden’ style porcelain factory was not located nearby, but in Vienna, Austria. The Du Pacquier factory was founded by Claude Du Pacquier in 1718. 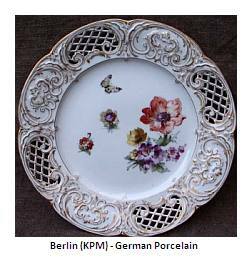 Numerous factories were eventually established throughout the German speaking world, supported by the many Princes who wanted the prestige of a porcelain factory – the new white gold. Notable makers were Nymphenburg, Berlin (KPM), Höchst, Ludwigsburg, Ansbach. Fürstenberg, situated about 200 miles to the west of Dresden, near Brunswick, began production in 1747 and, second to Meissen, claim to have the oldest uninterrupted production in Germany (see under 'F' for more details). Oldest of the true Dresden Makers is Volkstedt founded in 1762 (see under 'V'). Hutschenreuther based to the south in Bavaria near Selb, was founded in 1814 (see under 'H'). Rosenthal of Selb was founded in 1879 (see under 'R'). Of the original factories only three big makers survived - Meissen, Nymphenburg (see under 'N') and Berlin (see under 'B'). see Dunoon bone china modern bone china manufacturers section. see the Franciscan Pottery page. Franz was founded 2002 by Francis Chen with its HQ in San Francisco, USA and its design and research center in Taipei, Taiwan. Production is in Mainland China. Chen studied German Literature at university and acquired the nickname Franz. Franz became the name of his brainchild – an idea that had to happen – an innovative new porcelain collection for today's market using ancient dynastic principles. Franz’s secret weapon in his quest is art consultant and designer Chao Sun - an expert in the techniques of the Chinese dynasties. Sun worked with the National Palace Museum for 10 years, and his designs have been acquired by both London's British Museum and Victoria and Albert Museum. 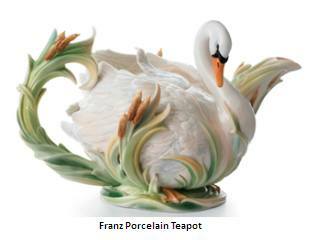 Franz appears to be thriving at a time when many porcelain makers are going backwards. Just goes to show what vision combined with expertise can achieve. 1747 On July 11, Duke Carl I. of Brunswick orders the foundation of a porcelain factory in Fürstenberg. Furstenburg continues to make a small amount of manufactured hand painted figures - The most well known of these are 15 Italian comedy figures. This china manufacturers claim to fame is to be second only to Meissen in uninterrupted production (see Dresden China under 'D').